This week, when I fly to New Zealand on a family visit, I will have with me a small sheet of drawing paper. In a top corner is a drawing of a bird flying over a hill, with a delicate watercolor wash. 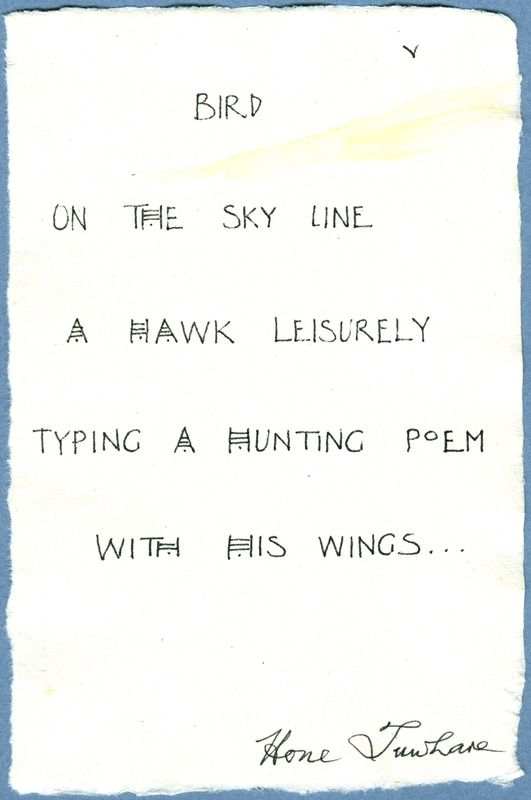 The rest of the sheet contains a tiny poem, hand-written in beautiful calligraphy, and signed by the poet/artist, Hone Tuwhare. The manuscript is one my treasured possessions. I have pangs of regret about parting with it, but know I am doing the right thing. In New Zealand Tuwhare’s work is considered a taonga, a treasure. He was the first M?ori poet writing in English to win widespread acclaim. 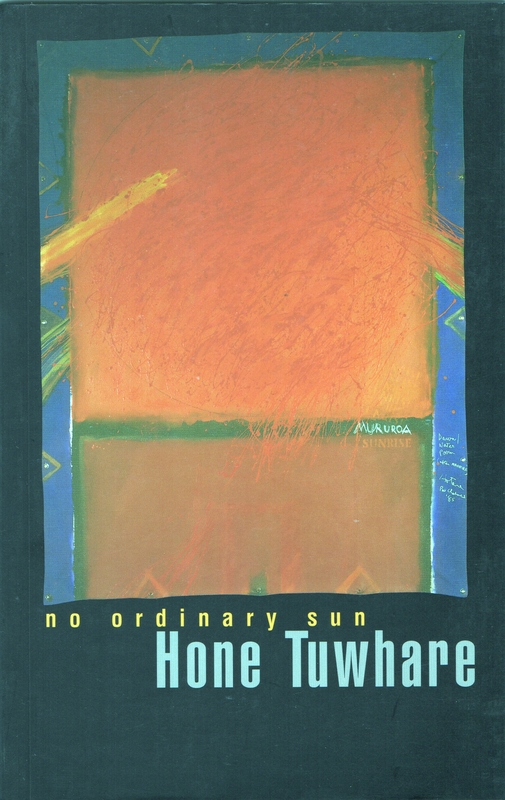 His best-known book, “No Ordinary Sun.” first published in 1964, was reprinted ten times over the next thirty years, becoming one of the most widely read individual collections of poetry in New Zealand history. The title poem is a response to French nuclear testing in the Pacific. Many more collections followed. His work has a conversational tone and incorporates both M?ori and biblical rhythms; the subjects range from the political to the personal and often powerfully evoke the beauties of nature. He won several New Zealand book awards, and was poet laureate of New Zealand in 1999–2000. He died in 2008, at the age of 85. The M?ori concept of taonga also includes the story that goes along with the item. 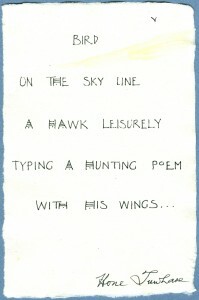 My little manuscript was a gift from Jean McCormack Tuwhare, Hone’s ex-wife. She and my mother-in-law were friends. On a visit to New Zealand in 2000, I spent a delightful afternoon with Jean at Mother’s house discussing poetry and literature. Mother had shown Jean my first poetry collection, “A Place Called Home,” and later suggested I send her a copy. Enclosed in Jean’s thank-you letter for the book was the Tuwhare manuscript. Unfortunately the letter is lost, but as I recall, Jean wrote that Hone (with whom she was still close friends) liked to practice calligraphy and had given her several of these small pieces to dispose of as she wished. She thought I might appreciate having one. I am of an age when I need to make decisions about my stuff. Knowing that the manuscript could easily get overlooked among our mountains of paper and art works, I sought professional help. I told Malcolm Moncrief-Spittle of Renaissance Books (New Zealand) , who deals in rare and out-of-print books, that I thought my taonga should be returned to New Zealand. Which university or cultural institution in New Zealand already houses a collection of Tuwhare material and would be a suitable recipient? I asked. He recommended the Hocken Library at the University of Otago in Dunedin. Staff at the Hocken Library responded to my query with enthusiasm. We’ve arranged a meeting on May 9, when I will hand over the carefully packaged manuscript. I know it will be a happy/sad occasion.